The domain within your query sequence starts at position 660 and ends at position 803; the E-value for the BLVR domain shown below is 5.3e-80. 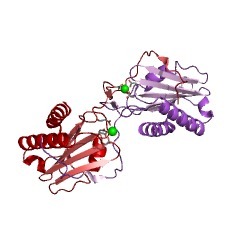 This family consists of several bovine specific leukaemia virus receptors which are thought to function as transmembrane proteins, although their exact function is unknown (PMID:12692298). There are 750 BLVR domains in 748 proteins in SMART's nrdb database. Taxonomic distribution of proteins containing BLVR domain. This tree includes only several representative species. The complete taxonomic breakdown of all proteins with BLVR domain is also avaliable. Click on the protein counts, or double click on taxonomic names to display all proteins containing BLVR domain in the selected taxonomic class. Evaluation of the delta subunit of bovine adaptor protein complex 3 as a receptorfor bovine leukaemia virus. A candidate gene of the bovine leukaemia virus (BLV) receptor (BLVR) was clonedpreviously and predicted to encode a transmembrane protein. Subsequent cloning ofrelated genes from other organisms indicated that the candidate gene is related, but unique, to a gene family of the delta subunit of the adaptor protein (AP)complex 3, AP-3. Therefore, bovine cDNAs (boAP3delta) that are highly homologous to the candidate gene were cloned and sequenced. The nucleotide sequencessuggested that the boAP3delta cDNA encodes the delta subunit of boAP3 withouttransmembrane domains. Part of the AP3delta cDNA isolated from the lymph node,spleen and MDBK cells, from which the BLVR candidate cDNA was derived, has almostthe same nucleotide sequences as the boAP3delta cDNA. A boAP3delta protein taggedwith green fluorescent protein was localized in the cytoplasm and incorporatedinto AP-3 in bovine cells. Unlike the previous report about the candidate gene,the boAP3delta gene introduced into murine NIH 3T3 cells did not increase thesusceptibility of the cells to BLV infection. Many small insertions and deletionsof nucleotides could generate the predicted transmembrane and cytoplasmic regionsof the BLVR protein from the prototypic boAP3delta gene.